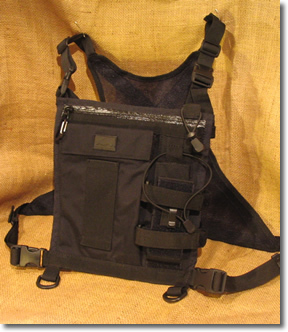 Right Stuff radio harnesses and civilian chest packs are among the highest quality chest packs you will find. Our packs are made with the highest quality materials and unsurpassed attention to detail. All models may be worn as a stand-alone pack or they can be mounted directly to the shoulder straps of your existing pack. We are confident that you will be pleased with your decision to choose Right Stuff and we support that decision with a 10 day money back garantee and a 3 year warranty against materials and wormanship defects. The Field Ops radio harness was designed specifically for folks who are looking for a harness that will help them stay cool in hot conditions. 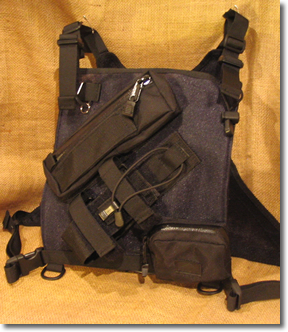 Please see our Chest Pack Accessories page to add a Pack Mount Kit. The Pro Patrol has the features and versatility to make it the first choice among professionals who often work in adverse conditions. Constructed primarily from urethane backed Cordura® 500 for optimum weather resistance and durability. 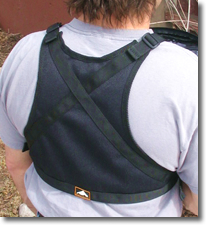 Deluxe Mesh Harness provides the ultimate in long term comfort and convenience. 3 Pockets provide plenty of storage and organization. The M2 may be the most useful piece of gear you will ever own. It is an incredibly versatile pack for all sorts of adventure and sport applicatios. Keep your most important, and most often used items right up front! 4 internal and 2 external pockets provide ample storage and organization of essentials. Compatible with Deluxe Mesh Harness and Pack Mount Kit for total integration and flexibility. Top quality construction and materials throughout. Please visit the M2 detail page for more photos and complete specifications. 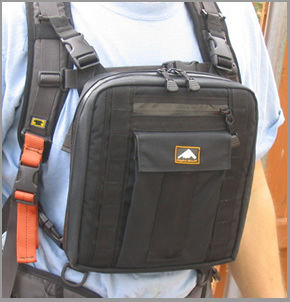 All chest packs come standard with our deluxe harness. This harness is fully adjustable and offers more comfort and better load distribution than any other harness you will find. It is made from a 450 Denier mesh for optimal strength, ventilation, and unsurpassed strap management.